If you've ever wondered how to start a non-profit and then took the next step and decided to start one, this book is for you. If you've begun filling out paperwork to start a non-profit, you know how tricky it can be. 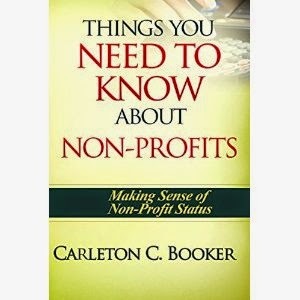 Carleton C. Booker, in "Things You Need to Know About Non-Profits," explains the tax aspects of starting a non-profit in succinct, easy-to-understand language. The book starts with the basics (what is a non-profit) and then moves onto the more involved info. The FAQ section answered a lot of questions I had. The book is formatted well with lots of bold, underlining, and easily digestible sections. For me, formatting is a big issue for readability when the topic is dense. I'd recommend this book to anyone who plans to start a non-profit.